The cool nights of autumn are a nice change from the oppressive heat this summer. Along with cooler weather, come all of the apple- and pumpkin-flavored recipes and food. This miniature-sized caramel apple is a perfect little bite of the fall season. Place peeled caramels into a heat-proof bowl. Place over a gently boiling pan of water or a double boiler. It will take about 10 minutes for the caramel to melt. Take your room-temperature apples and with a melon baller, scoop out as many round balls as you can get. It takes a bit of practice. Place apple balls in the lemon juice, which will keep the apples from turning brown. Remove from juice and dry off as much moisture as possible. Place a stick into each ball. Pull the caramel off of the heat and allow to cool off a bit. 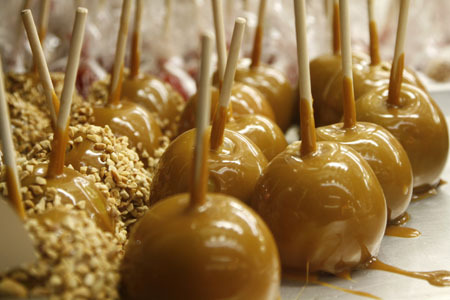 Dip each apple ball into the melted caramel, using a spoon to coat well. Place on a cookie sheet lined with waxed paper, parchment paper or buttered foil. Chill and enjoy!